Summary HAMAARI ADHURI KAHAANI is a Hindi language romantic melodrama about a wealthy hotelier who falls in love with a florist whose husband has gone missing. 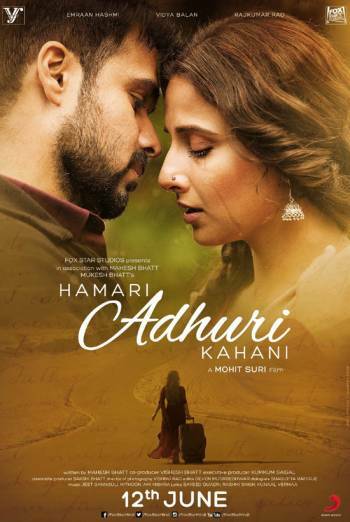 HAMARI ADHURI KAHANI is a Hindi language romantic melodrama about a wealthy hotelier who falls in love with a florist whose husband has gone missing. There are infrequent scenes of moderate violence, largely within a single montage in which a man is shot in the head, another is beaten, and men are killed by stepping on land-mines. There is limited sight of blood and no clear injury detail. There is also a sequence of attempted suicide in which a man runs in front of a car, although his collision with the vehicle is not shown. There are occasional scenes of moderate threat in which characters are held at knife point. There is a single Hindi language use of 'bastards'.